Colleges and universities always provide new students with a list of essentials they’ll need for both their studies and dorm life. 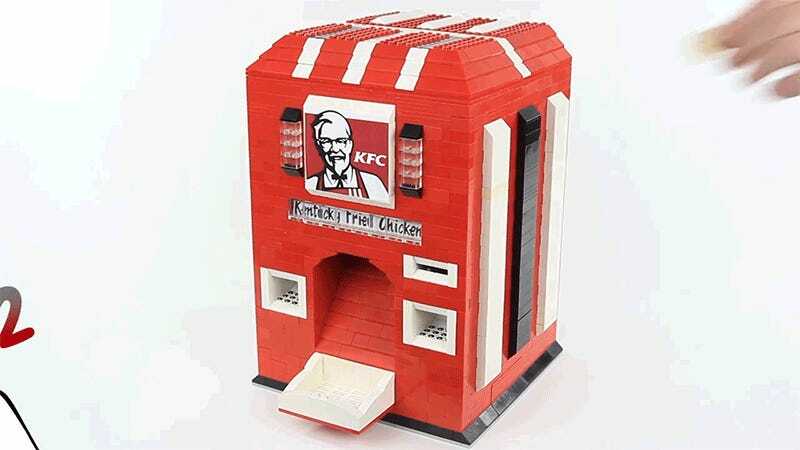 But ahead of laptops and shower flip-flops, this Lego KFC-dispensing vending machine should be at the top of the list. Have you ever tried to study, or play video games for 18 hours straight, on an empty stomach? It’s all but impossible. And after attending classes two or even three times a week, who has the energy to make it down to the cafeteria, let alone the closest KFC? If you can’t see why having a KFC vending machine right next to the beer pong table is so important, then you clearly don’t understand the challenges and difficulties of higher education.